And it only got bonkersier!! As 2018 draws to a close and a new year awaits, it’s important for PR professionals to take a look back to reflect on the year’s successes and challenges, while also preparing for what 2019 might bring. Muck Rack’s Jessica Lawlor checked in with 11 public relations professionals to hear about the biggest challenges they faced in 2018 — and to hear their predictions for the public relations industry as we head into 2019. 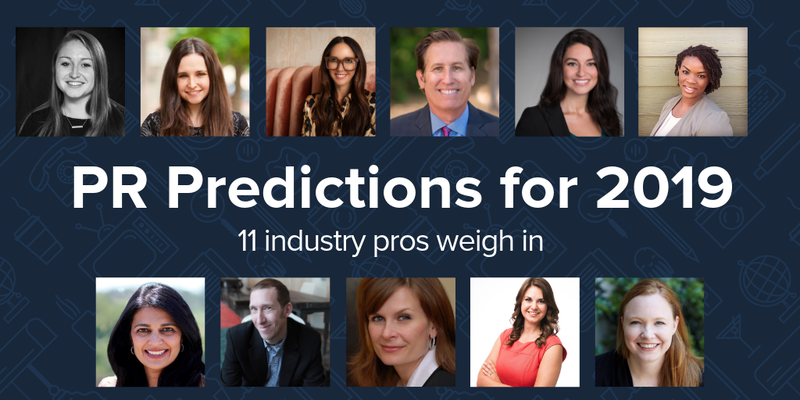 Head over to the Muck Rack Blog for PR predictions for 2019: 11 industry pros weigh in. In a first for his presidency, Trump Makes a Surprise Visit to Iraq to See American Troops (158,000+ shares), as Annie Karni, Mark Landler and Thomas Gibbons-Neff report at The New York Times. The reason? “Someone apparently got big-boy pants for Christmas and wants to show them off,” tweets Carmen Gentile. And then this happened: James LaPorta of Newsweek noticed that video posted to Donald Trump’s Twitter account may have revealed the deployment and identities of covert special forces in Iraq (200,000+ shares). “Current and former Defense Department officials told Newsweek that information concerning what units are deployed and where is almost always classified and is a violation of operational security,” LaPorta writes. Also while he was there, Trump told troops that he gave them their first pay raise in more than 10 years -- a falsehood he has repeatedly told, reports CNN’s Kate Sullivan. In fact, military pay has increased every year for more than three decades, but, you know, he “Just keeps saying it,” as Michael Kruse tweets. “Another hour. Another lie,” says Dale Bass. On Twitter, John Woodrow Cox tells us, “The reporting of this story, which features an unprecedented analysis of school lockdowns, took many months and included a review of *20,000* news stories, by @dataeditor, and data from school districts in 31 of the country’s largest cities.” And Steven Rich adds, “If you're wondering why I've been so tired, this story is the reason.” Their piece for The Washington Post finds schoolkids ‘Scared to death’: More than 4 million children endured lockdowns last school year. Tweets Tracy Jan, “The sudden order 2 hunker down can overwhelm students, who have wept & soiled themselves, written farewell messages 2 family members & wills explaining what should b done w/their bicycles & PlayStations. Heartbreaking read by @dataeditor @JohnWoodrowCox.” “How do we even begin to calculate the cost of this madness?” asks Jim MacMillan. At The Washington Post, Kevin Sieff and Carolyn Van Houten reveal what happens When death awaits deported asylum seekers (24,000+ shares). Ronald Acevedo waited eight months for asylum in Arizona. Days after he was deported, he was found dead in the trunk of a car. Colin O’Brady became the first person to cross Antarctica alone, unassisted and unaided by wind. He did the final leg in a grueling 32-hour burst, “And it only got bonkersier! !” tweets Francis Lam. Adam Skolnick has the full story at The New York Times. So here’s one you’ll want to check out if you’ve still got that script burning a hole in your back pocket: Calling All Writers! Jordan Peele’s Monkeypaw Productions Is Now Accepting Film And TV Script Submissions. Yesterday we asked: In 2018, the search term “octopus DNA” spiked due to which TV series? Answer: That was Jessica Jones – read more here, but beware the spoiler alert. Congrats to…this time, it was pretty much a tie between Buck Borasky and Roberta Rosenberg. Your question of the day for today is...Atlanta Mayor Keisha Lance Bottoms had to go on the defense after causing a Twitter uproar over a photo of what?